From daytime soaps to primetime soaps, sitcoms, dramas, mini-series, children’s programming, docu-series, awards shows, Saturday Night Live, game shows, and even animation, there isn’t much that Alec Baldwin hasn’t done on the small screen. Now he’s kicking off a new talk show, and it’s not even his first. His Up Late with Alec Baldwin ran briefly on MSNBC in 2013, before it was cancelled in the wake of an off-air confrontation with a tabloid videographer. Can this time be different? Will The Alec Baldwin Show be cancelled or renewed for season two on ABC? Stay tuned. 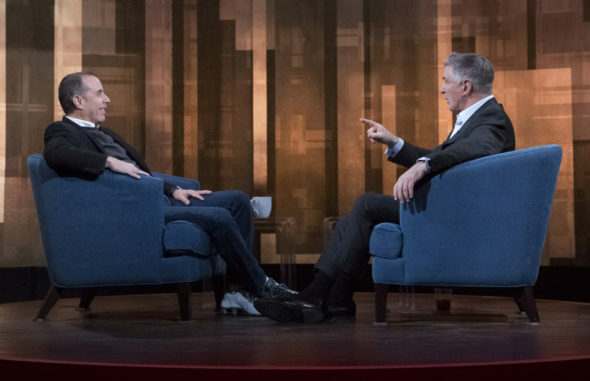 The Alec Baldwin Show is an hourlong weekly talk show, hosted by the Match Game host, 30 Rock veteran, and frequent SNL guest. It features Baldwin conducting one-on-one interviews with American pop culture luminaries. Guests in the first season include Robert De Niro, Taraji P. Henson, Kim Kardashian West, Ricky Gervais, Jeff Bridges, Mike Meyers, and Cecile Richards. For years, Baldwin has hosted Here’s the Thing, a podcast version of this format on WYNC. It and this series feature candid conversations and deep discussions. 12/30 update: You can see the rest of the latest night’s ratings. What do you think? Do you like The Alec Baldwin Show on ABC? Should this TV series be cancelled or renewed for a second season? I think it should be cancelled. The more I see and hear of Alex Baldwin, the more egotistical and biased he becomes. He just reminds me of a loud-mouthed smart aleck. Maybe he should interview President Trump, dressed in his snl skit costume, to improve the show’s crummy ratings. I think that the 3am running, psychic reader infomercial will soon have more viewers than this show. ABC was stupid for this and Baldwin was too cocky to say no.